Yes, of course it obtains a Name and Signature on delivery, but in todays competitive world of Logistics, that on its own is never going to be enough to win and retain high value contracts. Those contracts will go to organisations that provide a the ultimate customer experience. DeliveryPoD includes a utility to Create / Edit / Delete your own Tracking Stages. 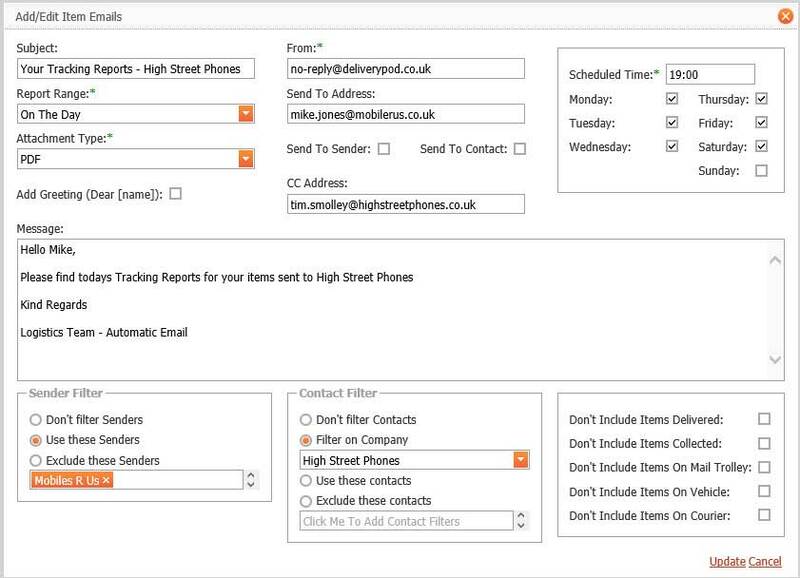 We configure these for customers so they start with a fully working system, however if new contracts come along that require new tracking stages, the customer can add these (or ask us to) as well as editing existing ones. When you are biding to win a new contract, the prospective customer will be interested in how you ensure things are delivered on time. Of course everyone bidding will say “we make every effort”, but those are just words. You can have as many as you like. 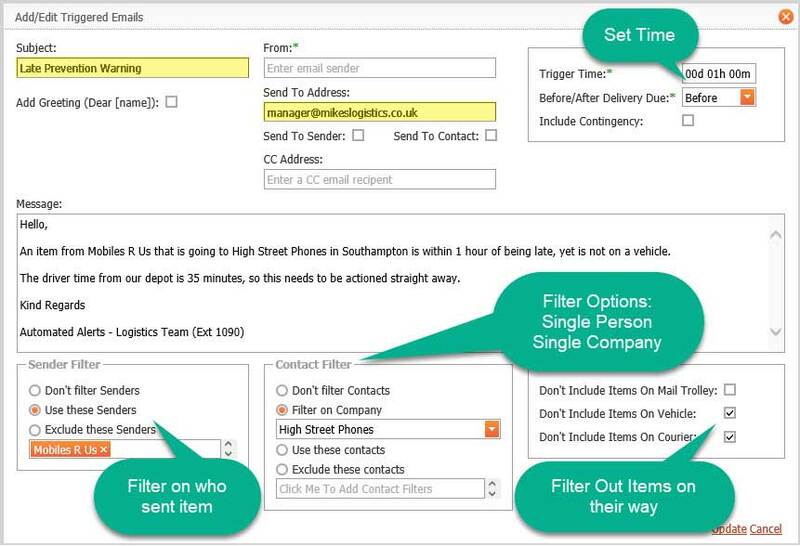 You can also use Filters to do things such as warn you of items within 2 hours of being due, not yet on vans for a specific Customer / Destination combination that is an extra long drive, then have a different email request for other items (without such as specific filter). Now you can show prospective customers how you are actively going to ensure that things are delivered on time. 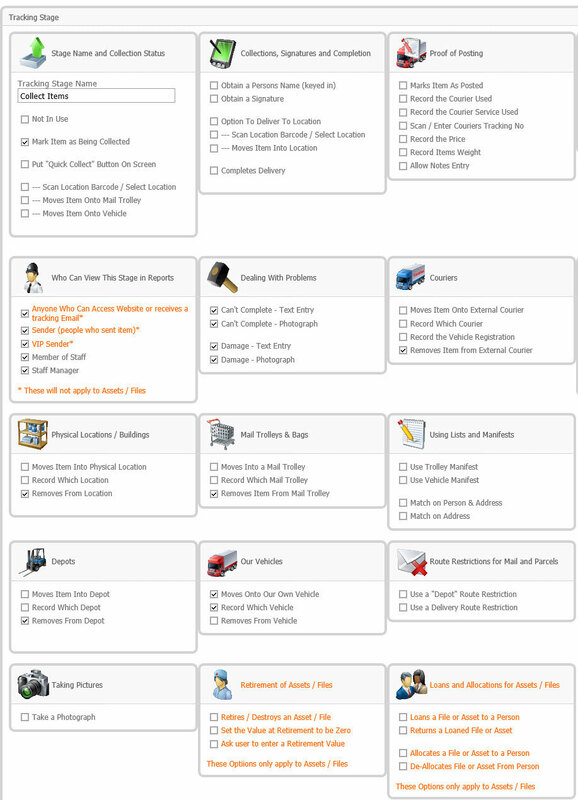 The Website also has live reports that can show you items in order of what needs to be delivered and by when etc. DeliveryPoD will normally have an Email Address of the Person an Item is Sent To. 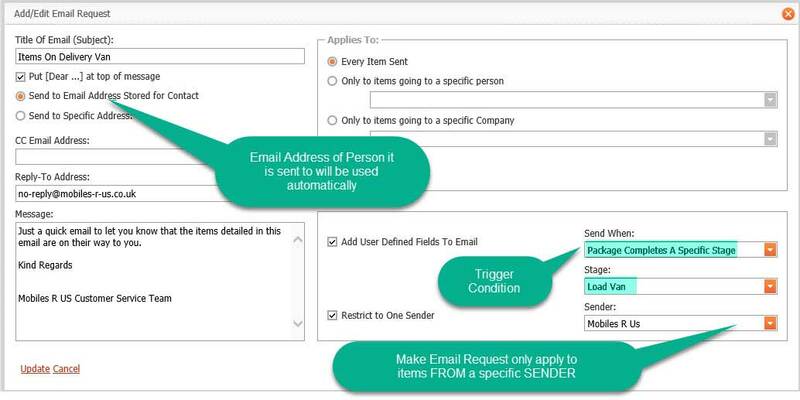 Because of this automatic email notifications can be set up very easily. Scan the Location Barcode (or select i), then Scan Item. You may use a Route Restriction (DeliveryPoD allows you to create a Route – say “Southampton and Bournemouth” then allocate Postcodes on that route. When loading a vehicle with a Tracking Stage where the “Use Route Restriction” box is ticked, the user is prompted to Select the Route, then as they scan the items onto the Van, the Postcode on the Parcel Label is checked against the Postcodes on the Route. If you are loading onto the wrong vehicle, the mobile computer will tell you. They scan the first item and the mobile computer shows all other items for that delivery point and invites the user to scan them all. At some point you need to get a Tracking Label onto the items you are transporting. This affects the method of creating the label and using it. This is the fastest way to label items. The “Who From”, “Who To” and other details are set as the label is produced. The downside is that there is software to install. However in most cases in 3PL we think it is worth it. Typically the FROM address is set before a batch of labels is produced. These are given to the customer who sticks the first part on the item (a second part is kept as a receipt), then the Driver has the option to scan the Barcode and Select / Enter who it is going to and all the other information. In some cases where the customer has a small number of fixed delivery points (such as shops),the label is produced with both the FROM and TO already set. These are “Generic” labels that the driver carries. They stick one part onto the item (the customer can keep the other part as a receipt). The driver scans the barcode, then sets who it is from and who it is going to. These are also a good option for ad-hoc pickups and returns. People / Companies that are sent items regularly (say for example a chain of stores) can be given access to the system, so they can see what is on its way to them from the moment the Tracking Labels are active. They can answer their own queries. DeliveryPoD supports the automation of reports being sent to customers, your customers customer as well as your own staff. DeliveryPoD is available for Microsoft based mobile computers. There is also a version for Microsoft Windows PC’s / Laptops. A version for Android and iOS is currently in development. We are often asked why we supply so many of these rather than a low cost non rugged smartphone? The main Couriers still use rugged mobile computers and since they buy tens of thousands, they will have evaluated the low cost option, yet have obviously dismissed it. Therefore it makes sense to look at why this is the case. Driver returns to depot to get a replacement scanner? What is the cost of that? Will you now breach your delivery promise on the items you should have been collecting / delivering whilst you were returning to the depot? Continue without a Mobile Computer? Do you record with pen and paper? Do you then get someone to update the system with that data when the driver returns to the depot? What if client needs a POD before then? What if an automatic email is meant to go on Delivery, Failed Delivery etc? Who puts the software on a new unit? Who sets up the unit on your Wireless LAN? Who handles the testing of the unit when it fails, before deciding to repair / replace? The concept of “just buy a new Smartphone” really needs to be questioned by any serious Logistics Manager. The cost of replacing the hardware is not the only cost here. You can scan barcodes with cameras and some cameras on the upper end phones are very good at this. Desk / Charging Cradles – When you have a large fleet, you really need to consider how do I charge these units? Can you get 4 Bay Cradles for your low cost Smartphone? Can you Daisy Chain the Cradles? Consider for a moment, the space, number of power sockets and cable mess if you have to put 100 single cradles in your depot. Can you connect the Cradles to the Network via Ethernet so you you have good backup communications? Our policy is to offer best of breed to our clients. So we constantly keep up to date with new devices then evaluate them, before deciding whether to adopt them. We then negotiate good pricing with our suppliers, buy in units for the sales team and a spare unit for the support team so if a customer has an issue, we can immediately try to recreate the issue. Currently our main offering in the Honeywell CN51 rugged mobile computer.